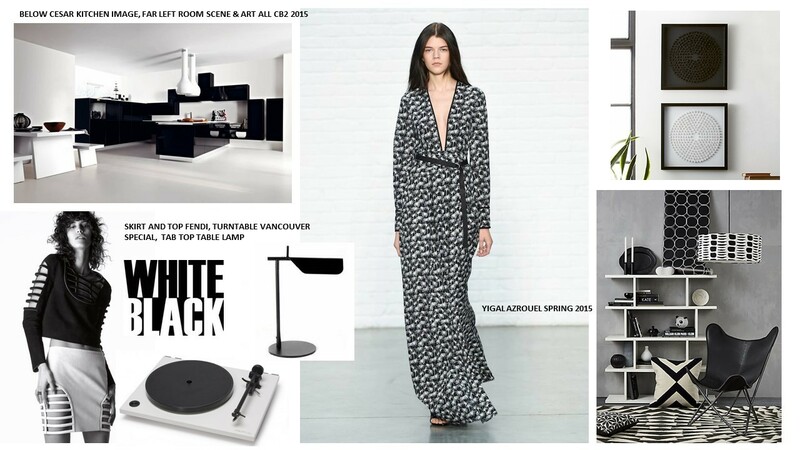 Our final Spring Trend topic is the ever classic Black and White. I mean who doesn’t like Black or White? Have you ever met a designer whose major wardrobe didn’t consist of mostly black? It is a workhorse, one of the essential basics. Oh how I dream of living in a white art gallery space……………… one day! And have you seen the cool black plumbing fixtures and washroom accessories on the market now? I really want an edgy industrial loft style project where I can specify these. Oh how I love thee black and white. You never go out of style! You always look good! You go with everything! You are so clean! You can be fresh, pure, timeless and Edgy!!!!!! Saks shows a black and white collection on their website featuring Jil Sanders, Marc Jacobs, Marni, Michael Kors – I will take one of each please! Harper Bazar showcases the fashion forward high contrast styles of black and white. The Fashion Spot claims designers are taking to pattern and textures to put a new spin on this trend. Any way you slice it – I believe this one is a classic and a trend that is here to stay. You can safely introduce this in your home and not fear the repercussion of dating yourself. 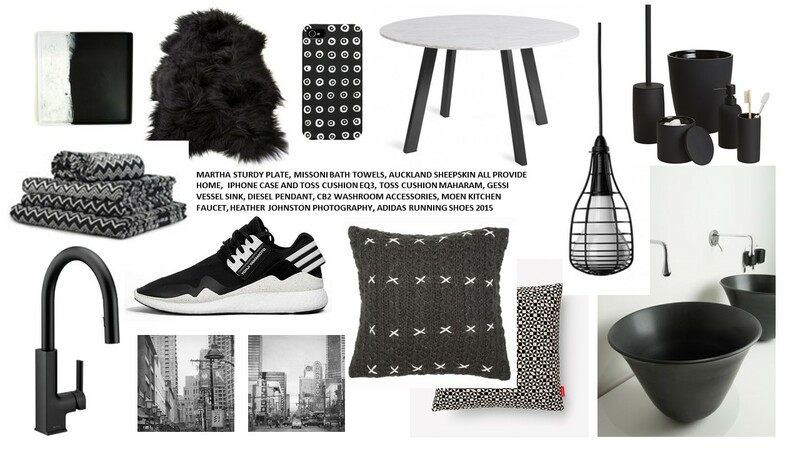 So go ahead get a white high gloss kitchen (I know you want too), add some black and white photographs, a black geometric toss cushion. I dare to say you are right on the mark! Well that rounds up our three trends, like em, leave em, what are your thoughts? We would love to hear what you have to say. Recently I went shopping with my niece and couldn’t help but think how funny it is that fashion trends are recycled so many times over. I can remember a time when I was a teen and would run home to show off my new proudly purchased fashions and my mom would shiver and then say she had “lived” that trend. Yikes………….. now I hear that voice in my own head! Ok back to our “Spring Trend” blog part two. Today we are looking at denim. Glamour tells us we should dust off our denim jacket that you can either go grunge, flared pants, shirt dress or super clean like we see at Michael Kors. Vogue claims denim is one of the top five spring 2015 fashion trends to watch. We’re in the midst of an incredibly fun and adventurous denim moment, when anything—from shredded to dark-wash, low-slung, or high-waisted, and even patched or bedazzled—goes. For every mood and every day, there is a jean, a jacket, and a skirt or shirt. Lately I have noticed every fabric rep that has entered our office wants to talk about the “Denim trend”. 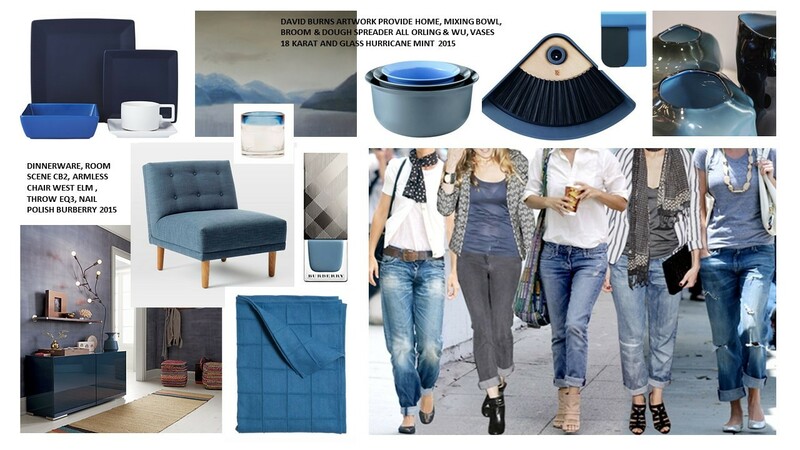 Looking to bring some blue into your home? Right now you can see every shade from very pale to almost midnight in the stores. West Elm and CB2 have furniture lines, bedding and dinner ware, Orling and Wu in Gastown have baking and cleaning accessories, and Provide Home on Beatty Street has original art. Whether its casual, sophisticated or sleek I am sure there will be something to please. Be sure to come back tomorrow for our last trend. We saved the best for last.